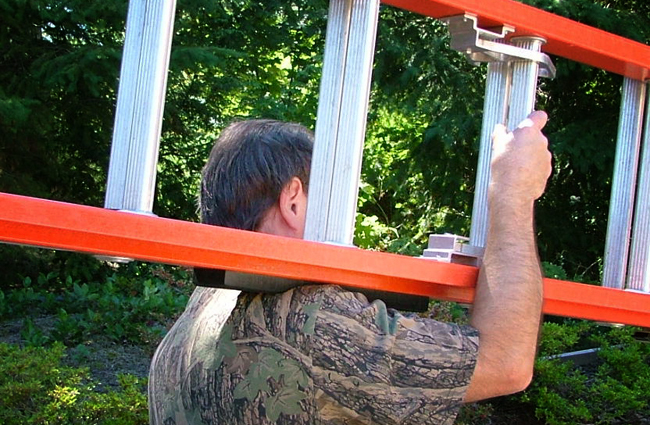 If you’re tired of the shoulder pain you experience when carrying an industrial-strength fiberglass ladder, we have some very good news for you. Made entirely of polyethylene foam, the PASR-3 is not only extremely strong and durable, it also provides excellent vibration and shock absorbency. And being able to tote your ladder without the accompanying pain means you can more readily carry the ladder in the proper way. So the PASR-3 even helps prevent shoulder and back injuries. It accommodates any shoulder size and shape. Its beveled edges minimize interference with clothing and objects, and help reduce wear and tear to a minimum. It’s also waterproof. Just squeegie the surface with your hand, and you can lay it on your shoulder without getting soaked – even on the rainiest of days. Installation is a breeze, requiring no tools. 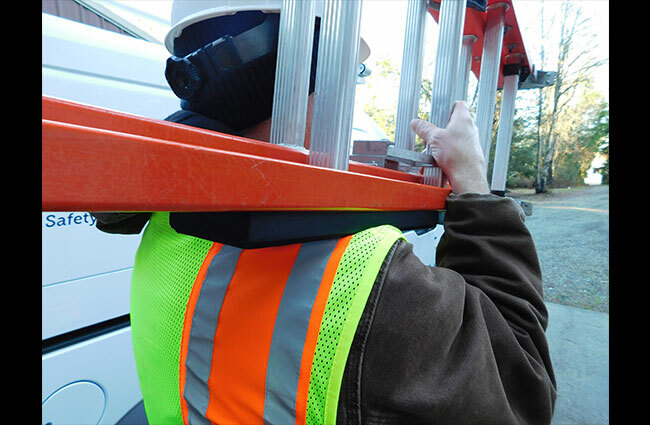 The PASR-3 Shoulder Pad fits most standard fiberglass and aluminum ladder rails, and it easily fits over rung protrusions, rivets and plates on the outside of the ladder rail. The PASR-3 wears like iron and sticks to your ladder like a good friend. 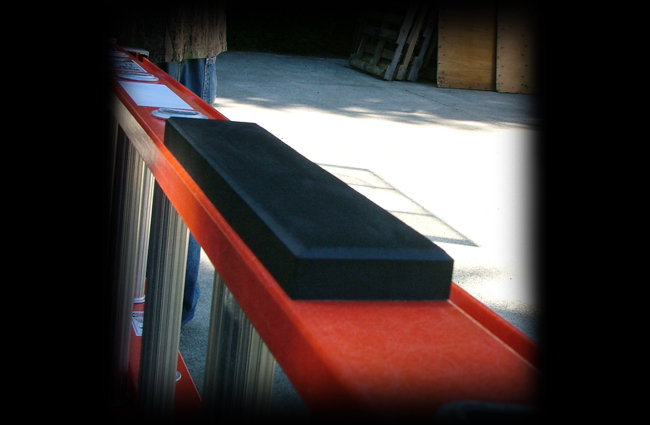 Once installed, you’ve added significant safety and comfort to your ladder – and less than 2 ounces (1.6 ounces) of additional weight! And it’s 100% recyclable. 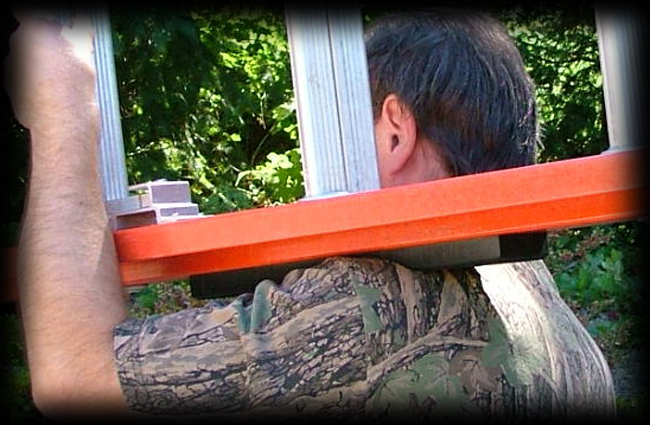 Ladder Compatibility – Fits most fiberglass and aluminum extension ladders. Compatibilidad de la Escala – Encaja la mayor parte de fibra de vidrio y escaleras extensiblees de aluminio. 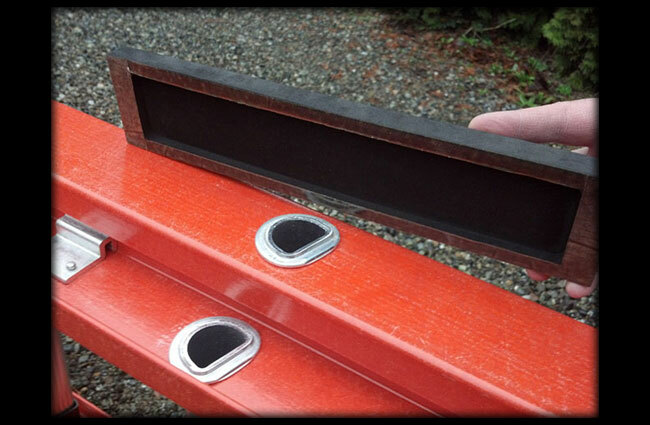 Installation Method – No tools needed. 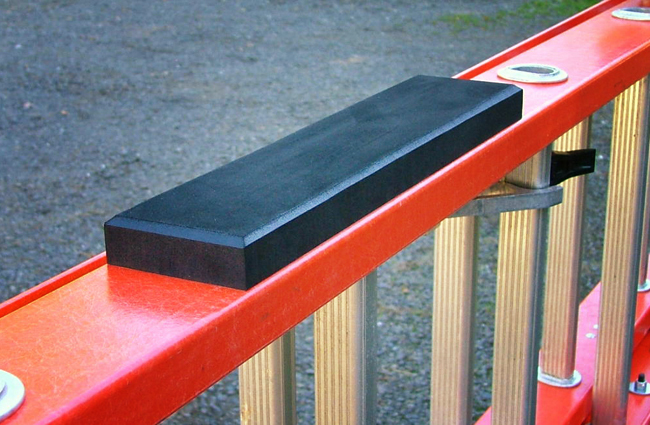 Clean rail surface with denatured alcohol. 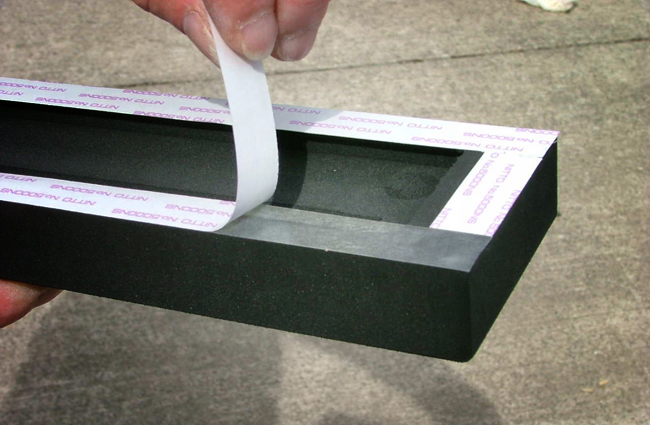 Peel paper away on carved out portion, exposing special adhesive, and apply to rail. Método de Instalación – Ningunos instrumentos necesarios. Limpie la superficie ferroviaria con el alcohol desnaturalizado. El papel de piel lejos en la parte forjada, exponiendo el pegamento especial, y se aplica al carril.